THE TEMPLE OF MAHADEVA ITAGI THE TEMPLE OF MAHADEVA ITAGI - Shiva Maha Purana, Vishnu Purana, garuda purana, bhavishya purana, skanda purana. Notable among the dynasties which have left their deep impression in South India is the Chalukyan dynasty which allowed diversity of religious sects, Buddhism, Jainism, Shaivism, etc., to influence art and archaeology, with the result that this region became an active centre of treat to architectural development. The Chalukyan style of architecture which was evolved from the Dravidian, subsequently achieved a distinctive character of its own. Some of the earlier examples of the later Chalukyan style are found in the northern districts of Karnataka, where the style originated and flourished. These temples differ from the southern group in their plan, treatment of exterior walls, the shape of towers, pillars and the design of the doorways. Unlike their southern counterparts, these temples do not have the star shaped plan, but are rectangular. The ‘vimana’ is a compromise between the early Chalukyan variety and the later Hoysala variety of southern region of Karnataka. These temples show a shift over from the course sandstone of the earlier days to the fine textured soap stone. A new architectural feature developed with the prominent projecting eve, often double curved in section, or a straight projecting to protect from sun and rain, and also enhances the dignity of architecture. These temples represent the culmination of later Chalukyan type in north Karnataka. 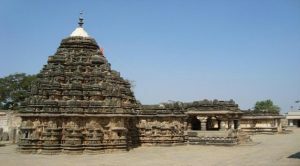 The temple of Mahadeva at Ittagi in Raichur district of Karnataka, is regarded as one of the most perfect and highly finished among the existing temples of the later Chalukyan style. Surrounded by ruins of several small shrines, this great Shaiva temple stands in the village of Ittagi at a distance of about 35 kms. to the east of Gadag. According to an inscription on a large stone slab in the verandah of the temple, it is believed that Ittagi was once a great centre of educational activity. It also mentions that the temple was constructed by Dandanatha Trikshetra Mahadeva, a high official of the Chalukyan king Vikramaditya VI, as a temple of Shiva under the name of Mahadeva, and was consecrated in the year 1112 A.D. The temple consists of an open hall, a closed ‘Mandapa’ with an ante-chamber, and the cells, all grouped together into a beautiful harmonious structure. The temple is of considerable size measuring 40 metres by 20 metres, and very well proportioned. The open hall at the eastern entrances measuring over 18 metres across, was originally supported upon 68 pillars, and is an exceedingly striking composition, and enhances the architectural beauty of the whole structure. Twenty six of these pillars are large ones, standing upon the floor and forming the main support of llie roof. The four central pillars are very nicely executed having been turned on the lathe. The closed ‘Mandapa’ has a doorway on each of its four sides. The doorways are very richly carved, and the ceilings of the porches are curiously ribbed. The decoration of the exterior, which is more architectural than sculptural, is intricate, but pleasing. The ceiling of the central hall has four triangular corner slabs which are marvels of stone fret work. The four central pillars support four large beams forming a square at the top. Another smaller square is set diagonally above this leaving triangular spaces between the two. These are closed with slabs whose under surfaces have been worked with a rich and heavy mass of hanging arabesque foliage and ‘makaras’ which flow from the jaw of a ‘kirtimukha’ mask. The tower of the temple, which is about 14 metres in height in its complete form, is mutilated at the summit losing its ‘kalasha’. As it is at present, the tower rises in three storeys with remnants of the fourth storey masonry work. These stages are quite distinct and are not cut up and masked by elaborate decorative detail. The small niches which decorate The centre of each storey, rising one above the other, are exceedingly beautiful. The deep cusping of the roll moulding which is pointed with little hanging buds, is designed in very graceful curves. The delicate lace-like workmanship is further enhanced by the background of rich dark shadows of the niche. These beautiful wreaths of filigree are repeated as ornament in the recessed panels of the walls below. I heir idols having disappeared. Within the ‘sanctum’ is the linga’ of Mahadeva, which is under regular worship. Ittagi was once known as the jewel among the temples in this region. Ittagi can be reached easily from Gadag. Regular train services connect Gadag with Hubli. A number of buses run at frequent intervals in various routes near to this village. Taxi or jeep can be hired at Gadag or Hubli to visit Ittagi. Gadag has facilities for food and accommodation for the interested visitors.